Johan Archambaud says that to make great Cognac, you need to have a grandfather who made great Cognac. Johan had 2 Grandfather's who made great cognac, plus a few Great Grandfathers and Great-Great Grandfathers as well. They have a document from 1791 granting the family official permission to distill - so the roots fun deep. The family now owns and farms 36 HA in Grande Champagne on various terroirs (Lignieres-Sonneville, Saint Preuil, Criteuil-La- Magdeleine and Ambleville) and 32 HA in Petite Champagne in the Arthenac region - a zone known for superior quality in Petite Champagne. Farming is Lutte Raisonee with a focus on biodiversity and sustainability. Johan is carrying on the family tradition, and as children often do, he is raising the bar. He has grown up with his 3 Copper pot stills and his wife jokes that they are his brothers. His understanding of the different methods of distillation in Cognac is encyclopedic. Although his Grandfather bottled a little bit of Coganc, his family has generally always sold to the big houses. Johan is now selecting a tiny portion of their production for this new endeavor. 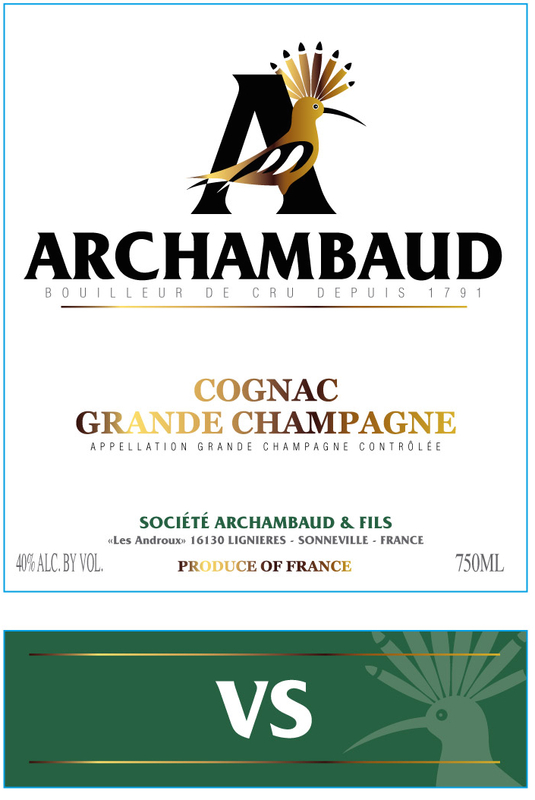 These two bottlings represent the future of Archambaud Cognac. They exist nowhere else in the world - except for a few bottles he kept for his father and for himself. A world premiere from a rising star in Cognac. Exciting stuff. Extremely charming for young-ish Cognac. Defined by a fresh fruit core and sweet wood notes. Great for mixing into cocktails and delicious on it's own as well. Complex, smooth, powerful and very long. A gorgeous spirit and a stellar first edition.